Paul Taylor (left) could be available for Posh against Coventry. Peterborough United manager Grant McCann has a striker selection dilemma ahead of the League One home match with Coventry City at the ABAX Stadium tomorrow (December 31, 3pm kick off). 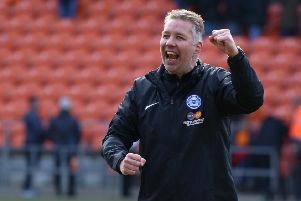 It’s a perm any three from five for the three most advanced positions as Posh attempt to return to the top six with a win against the ailing Sky Blues. Posh striker Tom Nichols has the backing of manager Grant McCann. Paul Taylor is expected to be available after missing the Boxing Day draw with Gillingham because of a hamstring problem, while Lee Angol’s first goal of the season against the Gills suggested he is ready to put an injury-plagued season behind him. Marcus Maddison and Shaquile Coulthirst are the players under threat from Taylor and Angol as McCann appears set to keep faith with Tom Nichols despite a woeful display of finishing from the young forward on Boxing Day. McCann said: “Tom is going to be a really good player at this level. I wouldn’t be surprised if he scores 20 goals for us in all competitions this season. “A couple of missed chances is not going to bother him. He’s one of the most confident players I’ve ever met. Posh forward Lee Angol is pushing for a start against Coventry. “It’s this club’s way to give young players a chance and I’ve done that this season with players who have received some abuse from fans. It’s one of the reasons why we’ve been on a good run. “Boxing Day came just too early for Paul Taylor, but I’m hopeful of having him back for tomorrow’s match. He’s a big player for us and his form in the few games before he picked up his injury proved that. he’d been involved in virtually every goal we’d scored. “Lee Angol is also a good option for us. He looked sharp against Gillingham. I’ve liked Lee since he came to the club. I gave him his debut at Oldham last season and he scored twice. Shaquile Coulthirst's starting place is under threat. McCann is wary of a Coventry side who sit next-to-bottom in League One within just four wins from 23 matches, especially as they have a new manager in Russell Slade who took charge before a 4-1 Boxing Day drubbing at Bristol Rovers. “New managers normally get a reaction,” McCann added. “Russell wouldn’t have had much time to work with the players before the first match so I’m expecting them to be tougher opponents for us. “They have some good young loan players and strong experienced players like Chris McCann in midfield, but we are at home and we need to stamp our authority on the game from kick off. Harry Anderson has a knee injury. Posh winger Harry Anderson requires a knee operation and will be out of action for seven-to-eight weeks. Anderson had only just been recalled from a successful loan spell at National League title challengers Lincoln City.